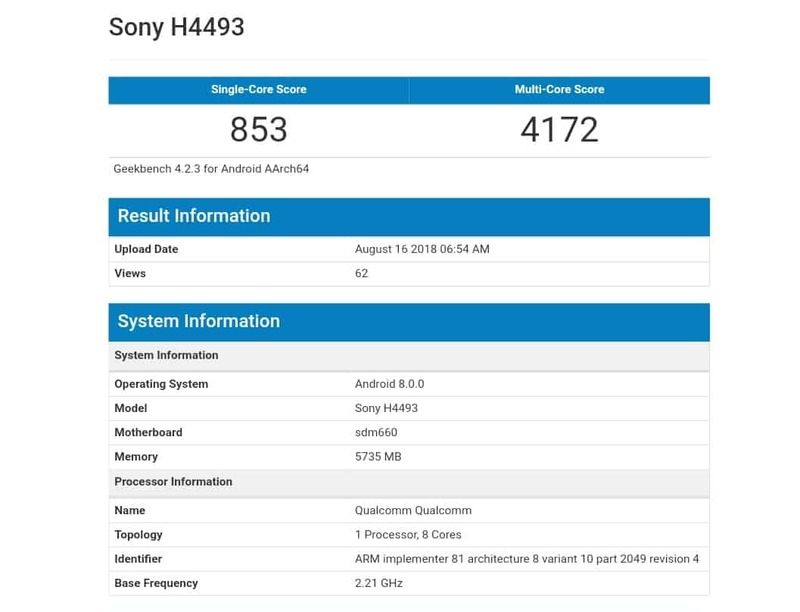 An unknown Sony smartphone passed through Geekbench yesterday bearing the model number H4493, which could possibly succeed the Xperia XA2 mid-range smartphone from the company. According to the benchmark listing, the alleged Xperia XA3 will be fueled by an octa-core Snapdragon 660 processor clocked at 2.21 GHz, a first for Sony, paired with 6GB of RAM. The operating system mentioned is Android 8.0 Oreo, which is kind of dated, considering Android 9 Pie is already out, and it could be in use only for testing purpose while Sony may ship the retail units running a newer Android version. Another thing pointing at the software’s early development stage is the benchmark score, which is significantly lower than what other smartphones with similar internals have touched. On Geekbench benchmarking tool, the Sony Xperia XA3 scored 853 and 4,172 points for single-core and multi-core tests respectively. The Nokia 7 Plus, that also comes equipped with Snapdragon 660, for instance, scored 1,636 and 5,902 points in the same pair of tests on Geekbench, even though its processor had a marginally lower base frequency at 1.84GHz. Poor software optimization appears to be a likely cause for these low scores and the OS version included in the retail units should address these issues. As previously mentioned, this is the first time for any Sony smartphone to boast a Snapdragon 660 chipset, which not only offers an improved performance over the Xperia XA2 series that currently retails running Snapdragon 630 but also includes a faster GPU – Adreno 512. The Geekbench database lists only the key specifications of a device and in this case, too, the listing couldn’t reveal much about the Xperia XA3. Previous rumors about the handset have suggested it to include a taller 18:9 display with an FHD+ resolution of 2,160 x 1,080 pixels, which is similar to the Xperia XA2 Plus announced last month. The upcoming mid-range smartphone has reportedly been certified by Eurasian Economic Commission (EEC) and TENAA with model numbers other than what the Geekbench listing mentions – H4413 and H4433. The Japanese company is rumored to make a product announcement at the upcoming IFA 2018 event in Berlin, where the Xperia XZ3 flagship smartphone may go official along with the mid-range Xperia XA3. You are reading an article on the Sony H4493 Mid-Tier Phone Hits Geekbench With SD660, 6GB RAM. All materials on the site Gadgets F, а также и статья Sony H4493 Mid-Tier Phone Hits Geekbench With SD660, 6GB RAM - written for the purpose of information enrichment and we are happy if you like our magazine.